Someone's laughing, Lord; Someone's crying, Lord. 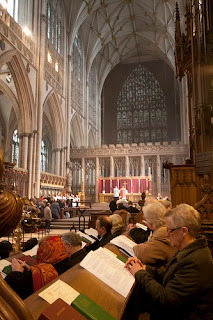 I think that York Minster must be one of the loveliest buildings in this country. It was good news that the first ever Extraordinary Form Mass was celebrated there recently. Congratulations to all concerned. Next time, perhaps a High Mass could be celebrated. I've been having a look at the Revised Grail Psalter, which you can find here, on Wikispooks, next to the Revised NAB version which is used in the States. It is very likely that we will be using the Revised Grail for the Breviary and for the Psalms at Mass in the future. One deep calleth another / because of the noise of the waterpipes. But, for good or ill, the Grail has got under our skin now in a way that the Jerusalem Bible and the now-moribund translation of the Mass have failed to do. It has sufficient quality to be familiar and easily known by heart; it reads easily, with the occasional exception. What pleases me about the new Grail is that while using inclusive language when the sense is inclusive, it retains gender-specific language when it is not. So it recognizes (which too many versions do not) that many of the 'men' referred to in the Psalms are Types of Christ. OG: Foundations once destroyed, what can the just do? NG: Foundations once destroyed, what can the righteous do? Anyway, so far I'm hopeful that it will work all right, unless a closer inspection reveals anything horrid. The original idea was that our new translation of the Missal would be accompanied by a new translation of the Lectionary, too. It was decided some time ago that we would use the NRSV version of the Bible, but that now seems to be no longer quite so certain. Not surprisingly, Rome has been less than happy with certain aspects of the NRSV, in particular its inclusive language. The publishers of the NRSVare less than happy with what Rome proposes; not just our desired modifications to the text, but even the 'incipits' we use in the Gospel: 'At that time Jesus said to the pharisees'; 'When Jesus came to Capernaum he said…'; this, it seems, they consider tinkering with God's Word (which, apparently, their inclusive language isn't). So now we have stalemate. There is a growing number of people who consider that the 'old' RSV would match better with the new translation of the Missal (especially if its thees and thous were altered). I hear that the Bishops of England and Wales have now decided that there are to be no further liturgical changes for another six years: that perforce will include the new lectionary. This, I suppose, is to enable people to get some wear out of any personal missal they might buy that has the new version of the Missal but the Jerusalem Bible and Grail Psalms. So publishers can get going, in other words, and not fear being left with a lot of useless stock, or not making sales at all. This means that we have six years to campaign for a decent version of the Bible for the Lectionary: fortunately it seems that the NRSV probably isn't going to be a runner after all. And in the meantime, I expect that we will see publishers of temporary books like Magnificat making a killing; Magnificat is a very good thing, though whether many parishioners can be induced to take out a subscription remains to be seen. I was reminded earlier of the alternative to the Ordinariate, known snappily as The Mission Society of St Wilfrid and St Hilda (SWISH), so I thought I'd have a look at their website to see what's going on. The answer is, virtually nothing! This really reinforces my view at the time, which was that SPLOSH was simply dreamed up by a couple of guys over a drink or two without any clear idea of what it was going to do ('we'll fill in the details later… whose round is it?'). The heavenly patrons must have been chosen at the one-for-the-road stage, for (as others have pointed out) it is hard to think of early English saints more devoted to Roman communion. But that too is unlikely. Their website says that it is for those who are 'unconvinced' that the CofE has the authority to ordain women. If they simply aren't convinced now, then perhaps they will soon become convinced, or at least prepared to tolerate a compromise. It always pays to leave a door open for a graceful retreat, I suppose. Fr Ray draws attention to the fact that very few in the traditional heartland of Anglo-Catholicism (London, Brighton and South Coast Religion) are taking the Roman Option in Ordinariate form (though some are joining the mainstream Church); there are a priest and some laity in Eastbourne, and two families in Chichester. That's it. It is puzzling. The Patrimonial Doctor made some reference to it a few weeks back, noting that those formerly loudest in their Romanistic Professions are those who are staying, while those who were simply steady Anglicans seem to be wading into the Tiber. is it because Bishop John Hinde provides a temporary illusion of 'business as usual'? That might well suit some of the gin-and-lace brigade. An incumbent not far from me declared his intention of simply staying on till he retires 'and then I don't care what happens'! That's okay by me; I'm not sure I'd feel comfortable with somebody with so little zeal or principle as a colleague. I hope that this is just an ugly rumour put around by opponents of the Ordinariate to dissuade people from its arms, or else an early April Fool joke. This thing, according to Damian Thompson, is being considered by the Bishops' Conference as the 'pro-cathedral' of the Ordinary, or at any rate its London base. Better to share a church, I should have said. Surely there must be better buildings around. Does the pro have to be in London? There are plenty of fine churches in Liverpool in need of a careful owner. And, if it isn't too late and there are some funds to care for it, there is the splendid church at London Colney, which the Diocese of Westminster no longer needs. It is pretty well axiomatic that if you want to read a reasoned and charitable discussion on important issues, you won't find it in blog comment boxes. There 'Mr Angry of Purley' has full rein, barely even subject to editorial moderation, to write what his most extreme emotions tell him to write at two o'clock in the morning, perhaps having worked his way through most of a whisky bottle. And he doesn't even need to write his real name. From his hermitage (or his computer room anyway) he damns the world, and certainly weasel priests like me who hesitate to turn our altars around immediately and begin celebrating the Traditional Mass exclusively, no matter what our parishioners think. The poor Holy Father is often invoked in all this 'why won't he just order the bishops to X…?' (here write in whatever your particular gripe is). There is no consideration as to what will happen if the bishop says 'no!' What does the Holy Father do? Excommunicate the bishop, of course! And when two-thirds of the episcopate are excommunicated, what then? It is just the same, on a smaller scale, in our parishes. I should, apparently, order my musicians to put away their guitars and use the Liber Usualis from next Sunday. Well, what if they say no? I could indeed turn my parish into a screaming hell-hole of bitter arguments, but would that actually serve any purpose? In the end, my parishioners would, the majority of them, either mutinously put up with the situation, or else go somewhere other for Mass, or lapse. I would actually inoculate them against the very thing I was trying to bring about. 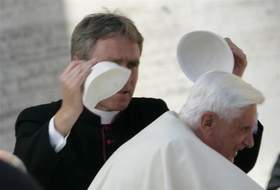 I am completely convinced that Pope Benedict and, indeed, the Doctor Lapidarius Father Zuhlsdorf have it right. 'Brick by brick, folks'. The Church tried repression before. In the past, of course, it could back up its commands with the Inquisition and the State's pyre. Those options aren't open to us; our age in that respect is more civilized, thank God. But in our modern world, people really can vote with their feet, and they need to be persuaded, not ordered. Both Blessed Pius IX and St Pius X, wonderful men, tried dealing with what was then called 'Liberal Catholicism' and came to be called 'Modernism' with repression. It worked up to a point. But only up to a point, Lord Copper. If a person asks an intelligent question, one is well advised to try and give an intelligent answer. The response 'you aren't allowed to ask that question!' may produce compliance, but a reluctant one. Resentments will seethe and brew under the surface, and the questions will not go away; rather they will become more insistent. In a more liberal age, they will burst forth like a dam breaking, and carry away all sorts of good stuff in the torrent. 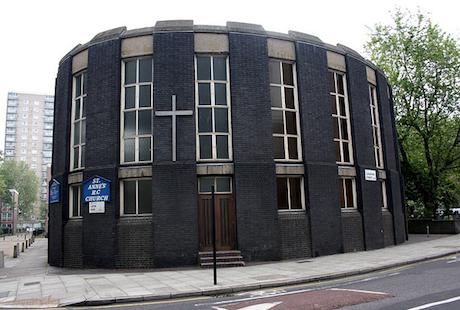 Is not that a good description of the Church of the 60s and since? Right now, the Holy Father could jump up and down, shout and holler for obedience. He is unlikely to get it from everyone, and he risks actually putting the Church into a worse state by trying. Instead, he is using the policy of the Doctor Lapidarius; brick by brick. At last, the serious questions of the liberals are being treated seriously and being answered by someone who doesn't lose his temper or his charity. It is an awesome sight. I re-read the other day the Introduction to the Holy Father's first Jesus of Nazareth book. He begins by saying that what he wants to do is simply, reconnect the 'Jesus of Faith' with the 'Jesus of History.' And does just that. Bingo! Is not that worth thousands of anathemas? Even The Tablet has to acknowledge the Pope's theological skill and eloquence! On the liturgical front, he presents what he thinks people can manage right now, and by doing it himself, encourages others to imitate him. Hence all the 'benedictine arrangements' appearing here and there. For those who want the traditional Mass, it can be freely offered. It is up to the Mr Angrys to go to them, support them, encourage them, and, brick by brick, rebuild what has been lost, only stronger and better, having learnt important lessons along the way. And that is the model for the parish, too. Brick by brick. No anathemas, just helping people to love and desire the truth because it is, just simply, better. His Patrimoniality, the estimable Fr Hunwicke has begun a series on councils. I commend it to you. I am looking forward very much to seeing what he has to say. 1) I am not convinced that, say, Nicæa I saw itself that way. Several of those who agreed to homoousios there didn't feel particularly bound to teach consubstantiality afterwards. Its prohibitions against bishops changing sees didn't prevent Eusebius, a signatory, changing from the see of Nicomedia to Constantinople. To my view, the fathers at Nicæa saw the council as being not a lot different from a local council, just on a bigger scale. It was an agreement, not a mouthpiece for the Holy Ghost. 2) How is one to regard a council, such as at Ephesus, where the business gets under way before an important party even has time to arrive and discuss the matter? Old Cyril of Alexandria (who presided) must be one of the several examples of people who became saints despite the magnitude of their, shall we say, darker side. The Syrians, who at that time had a problem with the dual nature in one person of our Lord, were the party concerned. They went off into schism as a result, labelled as Nestorians. A later great figure of the Syrian (or, better, Assyrian) schism, Babai the Great, with his work on qnome and parsopa came up with, basically, what Ephesus taught, but in different language. Are they to be held to the verbal formulation of Ephesus (which they don't like for reasons as much historical as anything else) if what they believe adds up to the same thing in any case? 3) The same thing can probably be said of Chalcedon and the Copts, Armenians and Jacobite Syrians. 4) Athanasius' little councilettes at Alexandria (21 bishops in 362) and Antioch (25 bishops) managed to overturn the Arian council(s) of Ariminum/Seleucia (500 (!) bishops in 359), confirmed at Constantinople in 360 (when the world groaned to find itself Arian) which certainly saw itself as an Ecumenical Council. No doubt he swung it because he had the support of the new Emperor (successor to Julian the Apostate), Jovian. 5) By the middle ages, it seems to have been established that a Canon (with an anathema) in a Council document was highly authoritative, perhaps infallible, whereas the preamble and any notes were illuminative (if I can put it like that). So when Trent teaches whoever denies that the Sacrament of Order consists of both major and minor orders, anathema sit, that's gotta be taken really really seriously, but when in a note it lists the orders as porter, lector, exorcist, acolyte, subdeacon, deacon, priest; that can be taken as seriously illuminative, but not infallible in any way (which it can't be, since the East does it differently, and Trent knew that—Council of Florence, and all that). 6) Vatican II has no canons at all. Some people, therefore, treat the whole thing as infallible. Is it all to be considered 'preamble' and therefore illuminative, or infallible? Others consider infallible the bits they like (Gaudium et Spes, for instance) and pretend the bits they don't like (the use of Latin must continue in the Western rites) don't exist. Traddies can be as guilty of this as trendies. Paul VI and Bd John XXIII seem to have thought that the council was to proclaim no new dogmas. What, then, does that make of the occasions when it does seem to vary from what has been held before? (e.g. Holy Orders as being Bishop, Priest, Deacon, see Trent above). Pope Benedict's idea of the Hermeneutic of Continuity is probably the best approach to this, but there are wrinkles that have to ironed out. The East (when it stops trying to long for the days of the Emperor) seems to think that 'reception' is what makes the difference between a dodgy Council (like Ariminum/Seleucia, or the Robber Council of Ephesus) and a pukka one. I think that this is rather like our notion of the Sensus Fidelium. In other words, it all depends on whom you speak to. When Gregory the Great went to Constantinople as Papal Legate, he found almost every single church there still basically Subordinationist (kind of Arian). It was really only after centuries that Nicene orthodoxy really rooted itself in the East. It has often been said that the Church thinks in centuries. Perhaps here we have an indication to Reception/Sensus Fidelium. It isn't an instant thing, but can take a very long time. Like the psychohistory of Hari Seldon, it only operates on a vast scale. A priest once commented to me that we are, sub specie æternitatis, still living in the Early Church; this is, of course, right. The bigger picture is something we will only see when we have all gone to our reward. What I think is harder to prove is that the Holy Spirit whispers in the ears of every Father in an Ecumenical Council in such a way that, in effect, every Ecumenical Council takes verbal dictation from God. In some ways, a Council opens up more questions than it hopes to solve; the present dialogue taking place between the Society of St Pius X and what it calls 'Conciliar Rome' is a good example of this. That the Society is still trying to settle this matter, and hasn't simply separated itself from the Church, as so many have before, is a very good sign, and may perhaps help us to settle this issue of what a Council actually is. If in any way I have gone over the line in this, I apologize, and submit my judgment to that of the Church. I am just trying to feel my way through an interesting set of ideas. We're using the new translation in its entirety here in the Seminary during Lent. This morning was the third celebration, and still the sky hasn't fallen down, nor has anyone walked out. People have commented that it's much easier to listen to than to read on the page, which is encouraging. One person, who habitually likes to demonstrate his competence in the Liturgy by making all the responses louder and faster than anyone else, forgot from time to time, and a couple of times shouted out 'and also with you' (he wasn't using the crib card, to show that he didn't need such things) thus tripping others up. Some sacred ministers were a little lost ('as confused as a Jesuit in Holy Week', they used to say) but all in all, it has been prayerful and a good experience. I am encouraged. An Anglican priest of my acquaintance spoke to me recently about a curious incident. The diocese in which he works contacted not him, but his churchwarden, to state that at the latest by the end of next year (and preferably via the diocese within a month) the land on which the church and churchyard stand must be registered with the Land Registry as always having belonged to the church. This must be asserted before a solicitor. • Why is this necessary all of a sudden? Is it because some congregations are hoping to take their buildings with them when they join the Ordinariate? • Does this mean that the Church of England is actually aware that its confident assertion that such alienation of property is not possible is actually not as watertight as it hoped? In fact, that congregations might successfully claim ownership of their own church? • Why was the churchwarden approached without the knowledge of the incumbent? Is it because, as a known opponent of the ordination of women, he might be thought liable to join the Ordinariate? One hears rumours of an E.U. law which says that if a congregation has been worshipping in a building for twenty years or more and maintaining it entirely at their own expense during this period it belongs to them. And presumably they could take it with them if they voted to join the Ordinariate or, for that matter (and no doubt preferably to some in Church House) the Unification Church or the Church of Scientology. From time to time I have seen and heard it asserted proudly by Anglicans that it alone in the West has preserved the proper order of the sacraments of initiation (meaning giving Communion after Confirmation). They might be interested in this article. Some Anglicans in Canada are pressing for the abolition of the requirement that communicants be already baptized. This they believe will reverse the continuing decline of the Canadian Anglican Church. According to this view, it would seem that the reason that Canadians do not attend the Anglican Church is because (a) they are not baptized, and therefore (b) are cruelly denied Communion. It follows that once it is announced that one does not need to be baptized to receive, then all the churches will fill up once more. Apologies to a couple of comment posters who didn't get their comments added recently. Usually, Blogger sends me an email to let me know that comments have arrived. For some reason, it didn't this time, so it wasn't until I logged into the Dashboard thingy that I discovered comments unpublished. It has now been remedied. A monk of St Hugh's Charterhouse would like to know if anyone knows anything about this picture. Can anyone help, please?